Often called the “Pearl of the Balkans”, the UNESCO World Heritage city of Ohrid is more than 5,000 years old, making it one of the oldest human settlements in Europe. The first inhabitants called it Lychnidos meaning City of Lights. It boasts a rich history and was once an important trading centre on one of the most famous ancient routes across Europe. Many of the city’s archaeological gems are still waiting to be uncovered. In the city centre, art historians, architects and archaeologists work together to bring these hidden treasures to light. Over the centuries, the city became a centre for Byzantine culture and Christianity. It was home to famous scholars including St Naum and St Clement who worked there for three decades and is still venerated by the people here. St Clement is also believed to have invented the modern Cyrillic alphabet. The first Slavic university was founded by St Clement 1,100 years ago and it became a centre where all the best professors, bishops and archbishops, were educated. They spread Slavic literature, culture, singing, and art all across the Balkans and Europe. 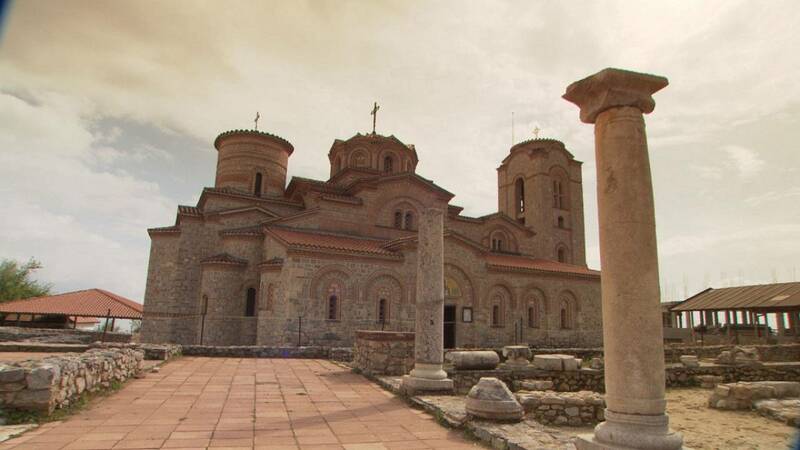 According to legend, 365 churches and monasteries were built in and around Ohrid – one for every day of the year. The city was an important archbishopric, often called The Jerusalem of the Balkans. Even today, many of these ancient jewels are still dotted around the lake, one of which is the thousand year old church Saint Sophia. The spectacular Byzantine-style wall paintings date back to the 11th century. Special techniques were used for applying these colours. Today, restoration workers are bringing these damaged frescos back to life using watercolours and a steady hand. The next edition of Macedonian Life will come from the Matka canyon where we will explore a mystic cave. We’ll also travel to the Dojran lake, and explore the traditional lifestyle of the fishermen there.